Dey Street Books, 9780062369680, 240pp. Exploring how millions are affected anxiety, Hi, Anxiety is a clarion call for everyone—but especially women—struggling with this condition. Though she is a strong advocate for seeking medical intervention, Kinsman implores those suffering to come out of the shadows—to talk about their battle openly and honestly. 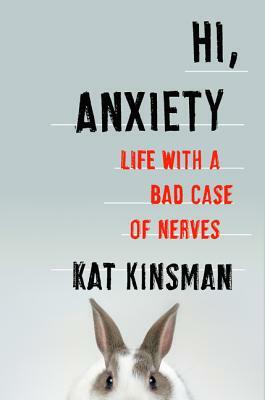 With humor, bravery, and writing that brings bestsellers like Laurie Notaro and Jenny Lawson to mind, Hi, Anxiety tackles a difficult subject with amazing grace. Kat Kinsman is Senior Editor of Food and Drinks for Extra Crispy, a food website devoted to the joys of breakfast. She is the former editor at large and former editor in chief of Tasting Table and editor for CNN.com, where she was nominated for the James Beard Broadcast Award in the TV segment category and won the 2011 EPPY best food website for CNN’s Eatocracy. Kinsman is a frequent public speaker on the topics of food and mental health. She lives in Brooklyn with her husband.